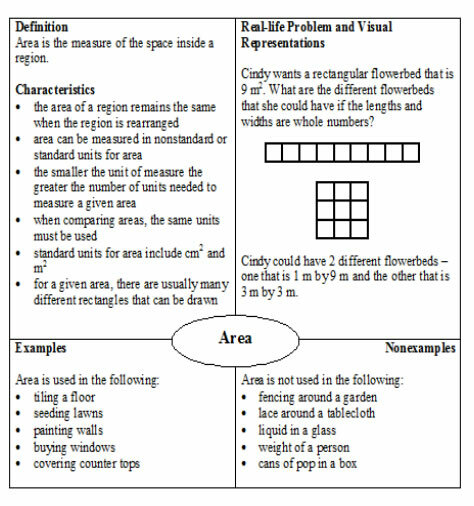 In these lessons, we will learn how to estimate and measure the area of a variety of shapes. We have videos and resources suitable for Grade 4 Math. Area is the measure of space inside a region. Objects of different shapes can have the same area. The following figures all have an area of 5 square units although their shapes are different. • the area of a region remains the same when the region is rearranged. • area can be measured in non-standard or standard units for area. • the smaller the unit of measure the greater the number of units needed to measure a given area. • when comparing area, the same unis must be used. • standard units for area include cm2 and m2. • for a given area there are usually many different rectangles that can be drawn. The following is a sample Frayer Model for Area. The number of units needed to cover a shape is the area of a shape. The units must be the same size. The units must be congruent. You can find the area of a shape by counting how many units cover it. To find the area of rectangle, we can count the square units or multiply. Estimating and measuring area of squares and rectangles. Estimating and measuring area of a variety of shapes - triangles and other polygons. Estimating and measuring area of a variety of shapes in square metres. Creating rectangles with a given area. Explain why the square is the most efficient unit for measuring area. Compare and order areas by counting square units. The diagram shows the area of the sandbox Mr. Matthews built in his yard. What is the area, in square units, of the sandbox?